So by special request I’ve had a go at banana bread this weekend. My first attempt was a dairy free, low gluten (spelt) banana bread and then I’ve also tried out my friend Colette’s mum’s recipe (modified to replace butter with oil and a few other little additions of my own) which does contain eggs (but these could be substituted out for apple puree). I’m not sure which I prefer. I’ve got so used to baking without eggs that I found the egg one a little odd to work with and I couldn’t work out if the batter was the right consistency or not. 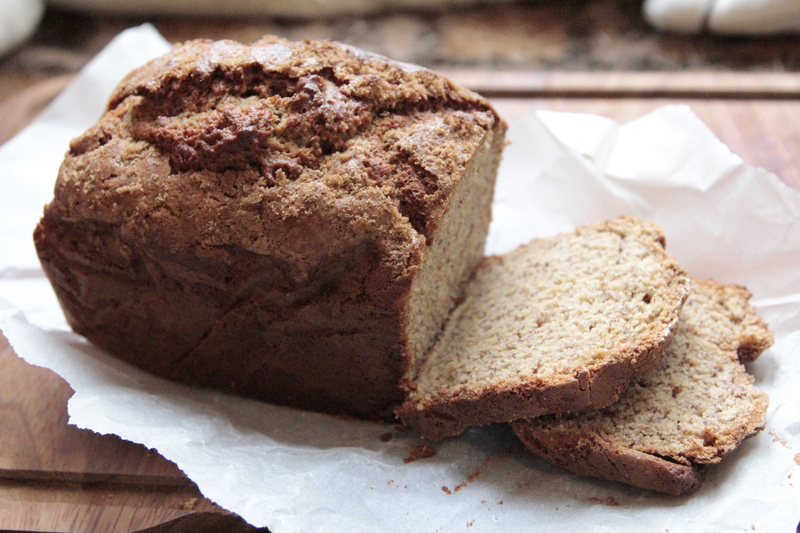 It actually came out fine and the texture is nice – a bit lighter and more bready than the dairy free version. The dairy free version is moist though and because I used wholemeal spelt flour it has a lovely nuttiness to it which I really like. So I thought I’d post both recipes and you can decide for yourself 🙂 Either of these recipes could have nuts added to them – walnuts would work particularly well, and if you’re feeling naughty you could throw in some dark chocolate chunks too! Preheat oven to 350 F / 175 C. Line and grease a small loaf tin (approximately 8 inches x 4 inches). Mix the flour, baking soda, cinnamon, allspice and salt together in a large bowl. In a separate bowl mix the oil and sugar together until well combined. Add the mashed bananas and the soya milk (to which vinegar has been added) and the vanilla extract. Add this mix to the flour mixture and stir well. Pour into the loaf tin and place in the oven for an hour, or until a skewer inserted in the middle comes out clean. Once cooked remove from the oven and allow to cool in the tin for 5 mins then transfer to a wire rack to cool. In a large bowl mix the oil and sugar together until well combined, then add the mashed bananas and vanila extract. In a separate bowl mix the flour, baking soda, cinnamon, allspice and salt together. Add half of this mix to the wet ingredients and mix well. Then add one egg and mix until combined. Add the rest of the flour mixture, stir well and add the final egg. Mix until well combined. Mix the bicarbonate of soda in 1/4 cup of hot water and stir in to the mixture. Pour into the loaf tin, sprinkle some unrefined coconut sugar over the top and place in the oven for an hour, or until a skewer inserted in the middle comes out clean. Once cooked remove from the oven and allow to cool in the tin for 5 mins then transfer to a wire rack to cool. This entry was posted in cakes, dairy free, low gluten, vegan and tagged a cake recipe, baking, banana bread recipe, banana cake, banana loaf, cake recipe, cake recipes, comfort food, dessert, dessert recipes, desserts, healthy foods, healthy snack, healthy snacks, home made snacks, recipes, vegan, vegan recipes, vegetarian, vegetarian recipes by Dr Nancy P. Bookmark the permalink. Wow– the way this loaf rose up in jaggedy peaks from the pan is gorgeous. It looks crunchy on the outside and moist on the inside. How perfect! 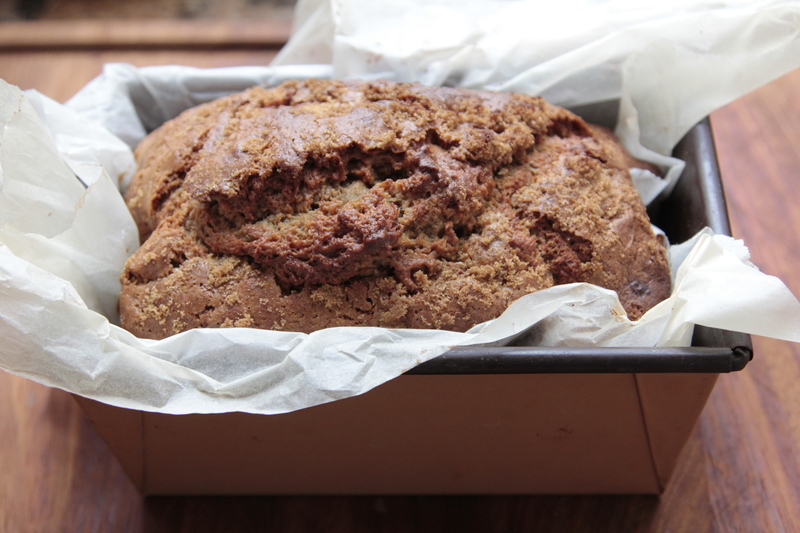 Oh my lord, what awesome looking banana bread – really impressive considering it’s vegan, love it. What youre saying is cpeoletmly true. I know that everybody ought to say exactly the same thing, but I just feel which you put it in a way that everyone can understand. I also appreciate the images you put in here. They fit so well with what youre trying to say. Im sure youll reach so several persons with what youve got to say.